I’ve been traveling a bit more than usual lately, on my own, which is different. When I was younger traveling the world from Bogotá to Tokyo, Tel Aviv to Athens, Seattle to New York—it was both exciting and no big deal in terms of exploring by myself. I’m adventurous by nature but these days I prefer to be with my family, so traveling on my own gave me a new perspective. Some of my travel has been back and forth to Long Island to take care of my elderly mother whose health is failing. The other was a single trip to Miami, Florida to meet with other website designers from around the world to discuss and develop our work, support each other, learn, and enjoy. I’m not entirely sure how to describe this, but a lot of the learning and the thinking I’ve been doing recently as a result of these journeys has been on the level of how and what do we really know about each other, even ourselves. Traveling alone I had the time to reflect on myself and interact with other people as an individual, away from my role as mom or wife. A lot is said about the internet giving us the opportunity to create the image we want of ourselves, one that might not be entirely accurate, so when I ventured to Miami I wondered who I would really find. You see, this group of designers interacts regularly over the web about our work, but many of us had never met face-to-face before. It turns out that the people I thought I knew were close to exactly the way I had come to know them online. No surprises—just a rich, deeper, more loving understanding of one another that could only be accomplished in person. Whenever I return home, the moment I move the car off the highway, I open the windows and am instantly welcomed by the freshness of clean New Hampshire air. Spring is here and with it the rich scents of lilac, lavender, apple and cherry blossoms, basil, mint, and marjoram. New life growing around us is truly affirming. 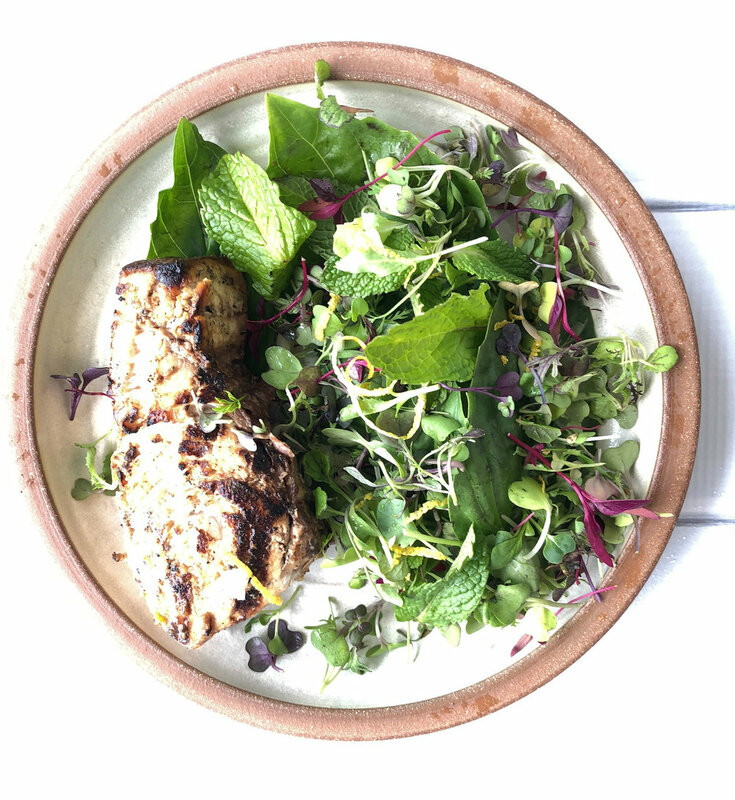 This dish of Grilled Swordfish with Spring Herb Salad is light and simple. The fish is marinated in a fig sauce which gives it some tenderness and a bit of crispy outer texture once it’s grilled. Normally a delicately flavored fish, cooked like this, it becomes filled with smoky flavors. The herb salad, with the aromas of mint and basil, are a light and refreshing accompaniment to the rich fish. Topped with some lemon zest and a bit of fresh salsa for spice, enjoy it any night of the week with chilled wine or beer and a loaf of fresh country bread. What travels and adventures have you had recently? What inspires you as a result? What have you learned? About one hour before cooking, place the swordfish in a bowl. Cover with the fig and vidalia onion sauce. Sprinkle with sea salt and freshly ground black pepper. Set aside to marinate. When the steak is done, cut it into 4 equal pieces. To serve, place one piece of steak on each of 4 dinner plates. Mound the salad ingredient on the plate. Drizzle with olive oil and lemon juice. Sprinkle with lemon zest, sea salt, and freshly ground black pepper. Accompany with fresh salsa. If you do not have Stonewall Kitchen Fig and Vidalia Onion Sauce available, substitute a mixture of 2 tablespoons olive oil, 1 tablespoon fig jam, brown sugar or molasses, 1 finely diced garlic clove, 1 teaspoon lemon juice, sea salt and freshly ground black pepper. Fresh Corn Salsa can be substituted for prepared salsa. View the recipe here. 🖨 Click here for a printable version of this recipe. If you choose to make this recipe, enjoy. Please take a photo and post it on Instagram with the hashtag #gatheringflavors.